Why do stucco homes get a bad rap? Most people have heard that stucco is bad and feel they should stay away from houses with stucco as the exterior material. Why? Stucco homes can be beautiful and have a European flair. There are two types of stucco – synthetic stucco, aka EIFS (exterior insulation finish systems) and hardcoat stucco. Hardcoat, or concrete stucco, usually has no issues. It just requires some maintenance. Synthetic stucco is the type that has a bad reputation – why? 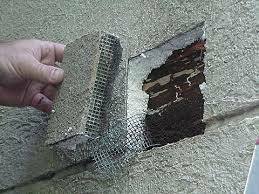 Because it is adhered to wood or gypsum board and if installed incorrectly it allows water intrusion and causes rot. Termites love moist environments. They get in there and eat the framing. Some relocation companies will not let clients buy a stucco home regardless of whether it is EIFS or concrete. Stucco has been successfully used for centuries in other countries primarily because it is adhered to masonry vs. wood. A stucco bond. In order to get a bond, you have to get a certified company inspect the house. Someone has to make any repairs suggested. Once the repairs are compete, there is a re-inspection and the stucco bond is issued. Remove the stucco and re-clad the house with a different material such as Hardiboard or brick. This is much more expensive, but it is a viable option. Whether you are looking to buy a stucco, brick, or hardiplank home, The Peters Company would be honored to help with your search! Give us a call at 404-419-3619 today! ← Congratulations to The Peters Company May Metro Atlanta Home Buyers !